Years ago. I started building a mouse boat. Ever since I was little, I have loved boats. I remember “Treasure Island” being read to me before I could read chapter books. A family reunion at a campground in Minnesota had a lake with sailboats. I was terrified when my father took me out, but it wasn’t long after, that I regretted not going out more. Several years later at a family reunion in Wisconsin, I was not old enough to sail the boats by myself, so I bugged every relative to go with me while I sailed the boat around the lake. 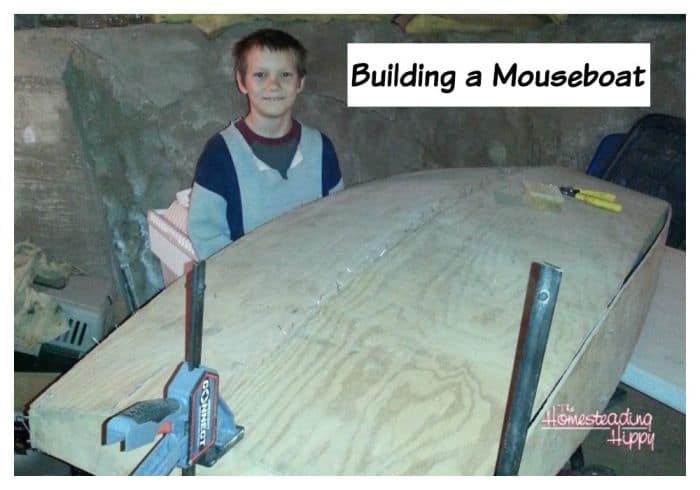 Many years later… After the arrival of Internet and a family, I discovered Gavin Atkin’s free plans for a mouseboat that could be build out of 1 sheet of quarter inch plywood! It used the stich ang glue method for assembly which meant that even I could build it without the best tools and mistakes could be covered up with a bit of glue! After buying the piece of plywood and cutting out the pieces with a hand saw, work stopped due to several moves and having to put the cut out pieces in storage. Every time I would see the pieces, I would think about how nice it would be to start assembling but it never happened. The plywood parts moved with us through several moves and eventually ended up in the basement (dungeon) under our house where we have lived for almost 10 years now. Recently, my youngest son told me he wanted to work on it with me. I was thrilled because finally there was someone that wanted to share my love of boats! I am not sure which he wanted more: to finish the boat or spend time with me or both. Either way it was awesome. So we have been working lately during our spare time to finish “stitching” the sides and bottom together. Where the two plywood pieces come together, I drill two holes close together in each piece and then my son a thin piece of wire a few inches long through the holes. We then twist the wire together to hold the plywood together. We repeat this every few inches. The purpose of the wire is to hold the plywood together while the glue (epoxy) hardens. When the epoxy sets up or hardens, it is just as stong at the wood so the extra wire can be cut away then. After the wire is cut away the rough edges are sanded smooth until the finished boat can be painted. We just finished the bottom center stitching. Now we need to do the bottom side before we can start gluing. Last will be the painting. What a great way to spend time together. I know my husband and son will love doing something like this together someday! Can’t wait to see the finished boat!